I translate lines 3 and 12 in Chapter 57 as Use non-responsibility when seeking all under heaven, and I am without responsibility and the people thrive themselves. I know that suggesting a virtue of non-responsibility flies in the face of common sense. Like free will, explicit or implied, being responsible is a virtue highly valued by society, so it’s not surprising that we hold very narrow views on this. I’ve written much on free will: See Mind in Body in Mind in Body…xin and Free Will: Fact or Wishful Thinking? These tie in with the whole notion of responsibility. Briefly consider the definition of responsible (1). Essentially, being responsible implies you respond to circumstances in a thoughtful, informed, and deliberate way. That sounds great doesn’t it? If only it was actually possible! Research reported in Science News, Brain cells know which way you’ll bet, tells another story. It hammers another nail in the coffin of free choice, responsibility, and control. Researchers enlisted eight people undergoing experimental therapy to alleviate severe depression or obsessive-compulsive disorder that involved implanting electrodes deep into the brain. During surgery, the electrodes eavesdropped on the behavior of individual nerve cells in an otherwise unreachable area of the brain called the nucleus accumbens. Other places in the brain feed lots of diverse signals to the nucleus accumbens: Information about a person’s emotions, memories and more sophisticated reasoning — key ingredients for decision making — all flow into this area. While in the operating room, participants played a simplified version of the card game “War,” in which two players each receive a card, and the higher card wins. Participants saw a video screen with their card face up next to a face-down opponent’s card. After a short wait, the players pushed one of two buttons to bet either $5 or $20 that they’d beat their opponent. Finally, the face-down card was flipped over, and the participants saw the results of their wager. Meanwhile, researchers detected 19 nerve cells in the nucleus accumbens that seemed to be involved in the betting. Electrical signals from these cells predicted whether a person would bet high or low. Most surprisingly, this nerve cell pattern was evident about 2.8 seconds before a player pushed a button — a delay so long that it’s “unheard of in neuroscience,” Patel said. This latest research shows that rather than being the principle actor in control and consciously deciding our choices, we actually are observing what happens after the fact. This has to be terribly humbling for any proud “I” (ego) to accept. Therefore, we probably don’t because “I” wants to be responsible and in control. Even more, “I” wants you to be responsible and in control. Indeed, civilized society requires us to believe in a responsible “I”. This closely matches our belief (2) in God and the like. No wonder chapter 71 says, Realizing I don’t know is better, not knowing this knowing is disease. In other words, knowing your belief is true is a disease. Wow! A more realistic way to see the thinking aspect of human consciousness is that our awareness is an observer after the fact. It is safe to witness what is happening moment by moment. Problems only arise when we project our own needs and fears onto our observations. I assume our brain’s mirror neurons in the premotor cortex play some role in this effect. The downside of this lies in how we trap ourselves in the abstract judgments we make and then carry them in memory, often throughout life. Much of our difficulty in life comes from how we respond to stimuli. Buddha’s Second Truth summarizes the effect: The surrounding world affects sensation and begets a craving thirst that clamors for immediate satisfaction. The illusion of self originates and manifests itself in a cleaving to things. The desire to live for the enjoyment of self entangles us in a net of sorrows. Pleasures are the bait and the result is pain. The “involved” of chapter 63 and “responsibility” of chapter 57 are synonym-like variations of the same character 事 (shì ; matter; affair; trouble; work; responsibility; involvement; serve; be engaged in). “Doing” mostly amounts to reacting to stimuli. An urgent sense of involvement and responsibility quickly and easily blows our reactions out of proportion to reality. Anything that can put time and space between stimuli and reaction reduces stress and danger. Using non-responsibility helps avoid the chaos of over-reaction by keeping awareness present rather than caught up in the dramas of the past or future. Chapter 8 advises, In action, satisfactory is time. Chapter 6 pulls in the ‘big picture’ that is essential in order to give one’s life enough time to flow naturally. Continuous, like it exists; in usefulness, not diligent. Any sense of eternity we can muster helps avoid deluding ourselves into thinking we or others are in control of life. Such delusions are not helpful in the long-term. Alas, we seem to take to heart only what we are willing and ready to hear. Even then, chapter 70 hints at the difficulty we face, Our words are very easy to know, very easy to do. Under heaven none can know, none can do. What about this post’s graphic? All discussions of free will that I’ve encountered bounce between some version of free will vs. determinism. 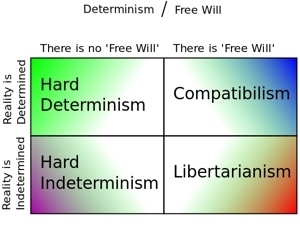 As the graphic shows, compatibilism strives to bridge the gap between free will and determinism — yet fails in my view. This worn out debate stems from archaic points of view: the Christian concept of predestination, the theological paradox of free will, and Newtonian physics. In contrast, biological need addresses this issue of choice perfectly, if you can accept the fact that we are like any other animal. As Arthur Schopenhauer said, “Man can do what he wills but he cannot will what he wills”. Or, as I might put it, we can do what we feel a need to do; we can’t choose what need to feel. Need and fear are the bottom lines in all animals, including humans. 1. the state or fact of being responsible. 4. a person or thing for which one is responsible: A child is a responsibility to its parents. 5. reliability or dependability, especially in meeting debts or payments. 1. an answer or reply, as in words or in some action. 2. Biology . any behavior of a living organism that results from an external or internal stimulus. (2) For more angles on belief, see Free Will: Fact or Wishful Thinking? , The Truth About Lies, and Are You A Beliefaholic? (3) Desire is simply the blending of visceral need + thought. All living things experience need. This and its partner fear are the motive forces that drive survival. See How the Hoodwink Hooks and Two Paths for a few more angles on this.